Tamarack Stables is nestled in the rolling hills of Virginia's historic Mason Neck area. Family-owned and managed by Tim and Cheryl Majewski, Tamarack Stables is 22 miles south of downtown Washington, on Old Colchester Road in Lorton, Virginia. It is an easy drive from most Northern Virginia neighborhoods. 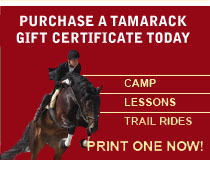 Tamarack Stables' riding school offers lessons for all ages and skill levels, from beginner to accomplished rider. Our experienced instructors help beginning riders become comfortable around horses and in the saddle, and then refine their equestrian skills. We offer group classes for beginners, advanced beginners, intermediate, and advanced riders. Visit Tamarack Stables and take a trail ride on our beautiful wooded trails along Pohick Creek. Our horses are well-trained and well-behaved, but certainly not dull. Horseback riding offers benefits for everyone! Need a fun theme for your next party? We specialize in Pony Parties. Host your party at Tamarack Stables, or we can bring our ponies to your location.